Victoria – A new report released today by Sierra Club BC – Carbon at Risk: BC’s Unprotected Old-growth Rainforest – shows that one year of logging old-growth rainforest in southwest B.C.is responsible for releasing approximately 3 million tonnes of carbon dioxide into the atmosphere. This has the effect of nullifying all of the province’s progress in reducing annual emissions. Sierra Club BC is deeply concerned about legislation introduced to enable a shift from volume-based forest licences into area-based Tree Farm Licences, without addressing the critical needs for carbon sinks and species habitat. The change in the Forest Act is supposed to secure access to timber for the industry in the Interior but could get applied in other parts of the province. “Keeping more forest carbon on the ground and ensuring more species adapt to climate change should be central to any change of forestry legislation. Instead, this change is now being driven by a myopic focus on feeding sawmills.” said Sierra Club BC’s forest and climate campaigner, Jens Wieting. The new report highlights the carbon stored in unprotected old-growth rainforest on Vancouver Island and the southern B.C. coast. It estimates the ongoing carbon loss due to logging in this part of the province. The report demonstrates that one year of logging in this region (2011) resulted in the loss of carbon storage equivalent to the 3 million tonnes in B.C.’s annual emission reduction achieved in 2010 (compared to 2007). “We blew B.C.’s entire carbon savings for a year because the B.C. government doesn’t have a plan to protect the rare old-growth forests of Vancouver Island and the South Coast.” said Wieting. Carbon dioxide emissions from logging old growth contribute significantly to the massive increase in overall emissions from BC’s forests. Though B.C. does not officially count emissions from forest lands, this source of emissions increased by 363% between 2000 and 2010 and is now higher than the province’s total official emissions. The uncounted forest emissions result from global warming effects like the spread of Mountain Pine Beetle and wildfires, as well as ongoing poor forest management practices such as slash burning and excessive wood waste. Sierra Club BC’s analysis identifies approximately 1.5 million hectares of old-growth forest in the Vancouver IsIand/South Coast area that are currently unprotected. Within this area, there are 600,000 hectares of relatively productive stands, with significant carbon storage capacity and a higher likelihood of getting targeted for logging. These forests alone store the equivalent of 13 times B.C.’s annual emissions. 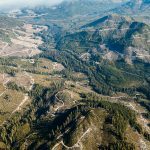 Sierra Club BC is urging the B.C. government to increase protection of ecosystems with high carbon and species habitat value, in particular temperate rainforests, as a key element in its response to global warming. Old growth rainforest is more resilient than younger forest, but BC’s ecosystems and suitable species habitat are shifting rapidly in a changing climate. Ecologists consider the remaining old-growth a “non-renewable” resource. “Forestry can be an important sector in a low carbon economy of the future, but not without increased forest conservation and improved forest management.” Wieting said.